President Donald Trump may be presiding over the disintegration of the UN Paris climate pact. President Trump’s decision in 2017 to withdraw the U.S. from the Paris pact set a global example and it may have led to the agreement potentially teetering on the brink of its own survival. It now seems that the latest UN climate “tipping point” is not about alleged dire man-made climate change impacts, but about saving the UN’s proposed “solution” to climate change! Since Trump clexit (climate exit from the UN Paris agreement) in 2017, many other countries have flirted with following suit on some level. Flashback: Cheers! 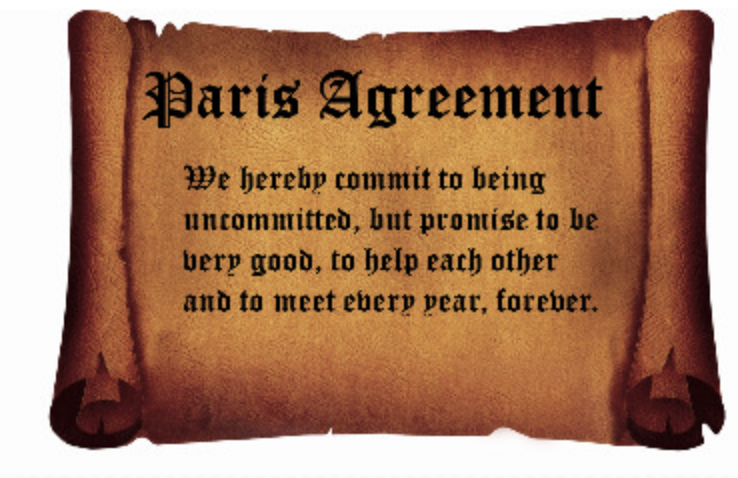 Skeptics toast U.S. exit from Paris pact at UN climate summit in Germany – The toast heard round the world. The six-day UN conference opened with an urgent plea from delegates to finalise a “rule book” governing the Paris Agreement, the most ambitious global pact yet, to address the impacts of climate change. The rule book will have guidelines for the treaty’s 197 signatories on how to provide support to developing countries worst affected, and manage the impact of climate change. “The credibility of the process… is at stake,” Michal Kurtyka, president designate of COP24, said at the opening of Tuesday’s meeting. As the impacts get worse, “the poorest and most vulnerable, who have contributed almost nothing to the problem, suffer more,” said Patricia Espinosa of UN Climate Change, in a statement. 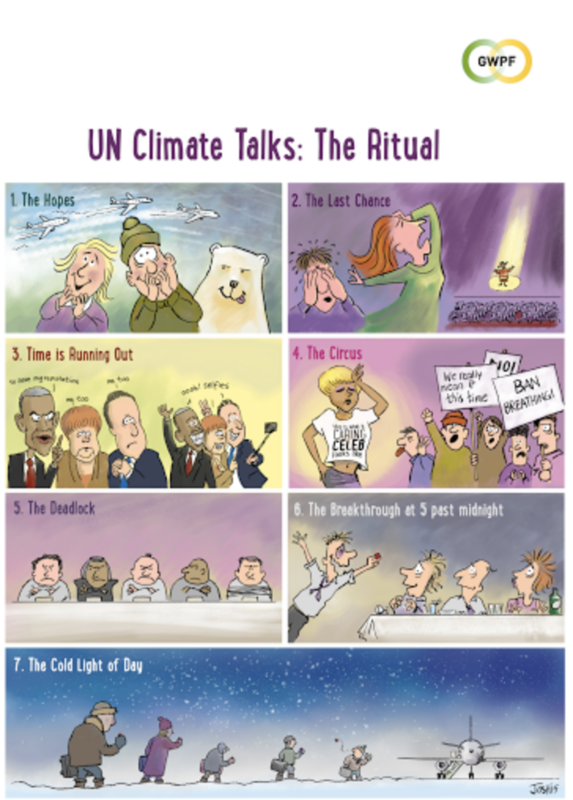 These ‘Conferences of the Parties’, or COPs as they are usually termed, involve all of the members of the United Nations Framework Convention on Climate Change and take place towards the end of the year. This year will see the 24th COP take place in Katowice, Poland. Envoys from almost 200 nations gather in Bangkok Sept. 4-9 to take the latest steps in the fight against climate change. Convened by the United Nations, the delegates from energy and environment ministries are working on a rulebook to implement the landmark Paris Agreement, where countries rich and poor would work to cut heat-trapping pollution. The talks aim to lay the groundwork for the annual UN climate summit, which takes place later this year in the Polish city of Katowice. 1. What’s the aim of the Bangkok talks? Civil servants are trying to agree on a set of rules that flesh out the 2015 Paris deal. What they produce will be fine-tuned and adopted by ministers at December’s higher-level meeting in Katowice. The co-chairs of the meeting have a difficult task on their hands. They must narrow an unwieldy set of working documents to something politicians can realistically agree on. 2. What happens if they can’t agree during these talks? There will almost certainly be more talks no matter what the outcome in Bangkok. This group has been meeting for three decades, producing historic agreements every few years. It produced both the Kyoto Protocol as well as the Paris deal. The meeting in Poland “will be in jeopardy” if there’s no satisfactory outcome in Bangkok, the organizers of the group said on Aug. 16. In an unusual step, they indicated support for another round of discussions before December if needed. 3. Why has it been so difficult to reach an agreement? There’s a sense of an absence of leadership pushing for action, with U.S. President Donald Trump vowing to leave the Paris deal and Chinese President Xi Jinping focused other issues ranging from trade to foreign policy. 4. What’s the U.S. position at these talks? While Trump has pledged to pull out of Paris, the U.S. remains a player at in Bangkok because it remains a part of the 1992 UN Framework Convention on Climate Change, the treaty that established the discussions. It also will take years to complete the withdrawal from Paris. That means Trump’s representatives remain influential even if they don’t endorse the end result. 5. What are China and India doing? The two economic powerhouses sit in the BASIC negotiating group (representing Brazil, South Africa, India, and China). In May, they committed to work toward a deal and want developed countries to take the lead in emissions. They’re also looking for evidence the richer nations will make good on a 2009 pledge to mobilize at least $100 billion a year in climate-related finance by 2020. India wants additional pre-2020 pledges from wealthy polluting nations. 6. What’s the likely outcome in Bangkok? Some parts of the Paris rule book are likely to emerge even if the whole package isn’t nailed down. There’s potential that nations will agree on a framework for channeling aid and financing to the poorest nations. Countries including Norway and Switzerland are looking to the carbon market as a possible transfer mechanism that would shift money to developing nations for cutting emissions in exchange for credits that richer nations could use to offset their own pledges. 7. What would failure mean for markets? No agreement in Bangkok would slow the process of setting up investment channels for greening the world economy….. The Paris climate agreement’s momentum has taken another big hit with a new challenge. Brazil’s presidential forerunner has indicated that the country will quit the Paris agreement if he gets elected. Will the outdated climate agreement survive the departure of developing countries? BRIC is an acronym that refers to the countries of Brazil, Russia, India and China—countries that are at a similar stage of economic development and considered to be the big developing countries. All these four countries signed the Paris climate agreement (2015), which required the 195 Signatory countries to reduce their carbon dioxide emissions to limit the increase of global average temperature to below 2°C above pre-industrial levels. The signatory countries were expected to pursue their Intended Nationally Determined Contributions (INDC), which lay out their respective plans to curb carbon dioxide emissions. But there are no legally bounding conditions to make these countries not leave the agreement. The Philippines was the first country to refuse ratification of the agreement. In 2017, the newly elected government in the U.S. announced that it would pull out of the Paris agreement. But even before these events transpired, it was believed that the agreement’s primary hurdle would be convincing the big developing countries to reduce carbon dioxide emissions, since coal accounts for the majority of their energy production. That was the idea that developed countries should pay developing countries compensation for the slowing down of their economic growth that would result from the mandatory transition from coal to more expensive renewable energy sources, as proposed in the agreement. 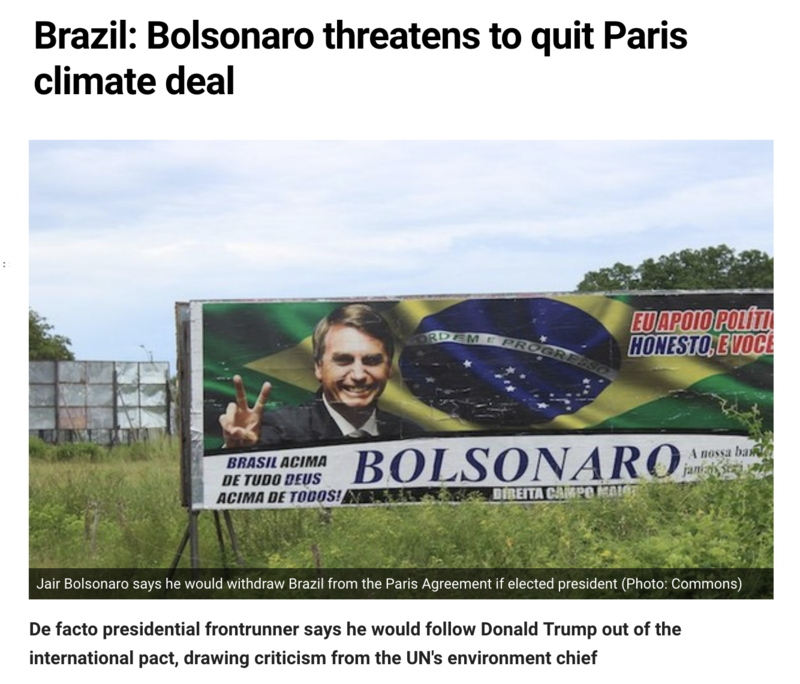 And the Paris climate express has now hit the last of the BRIC wall–Brazil. Brazil’s presidential forerunner Jair Bolsonaro has promised to pull Brazil out of the Paris agreement if he is elected. This comes as no surprise. Brazil has been lagging behind its BRIC counterparts in the energy sector. This is partly due to the unavailability of massive domestic coal reserves like those in India and China. Between 2010 and 2015, coal consumption in the country rose by 22 percent. To meet the growing demand, the country has increased its imports. 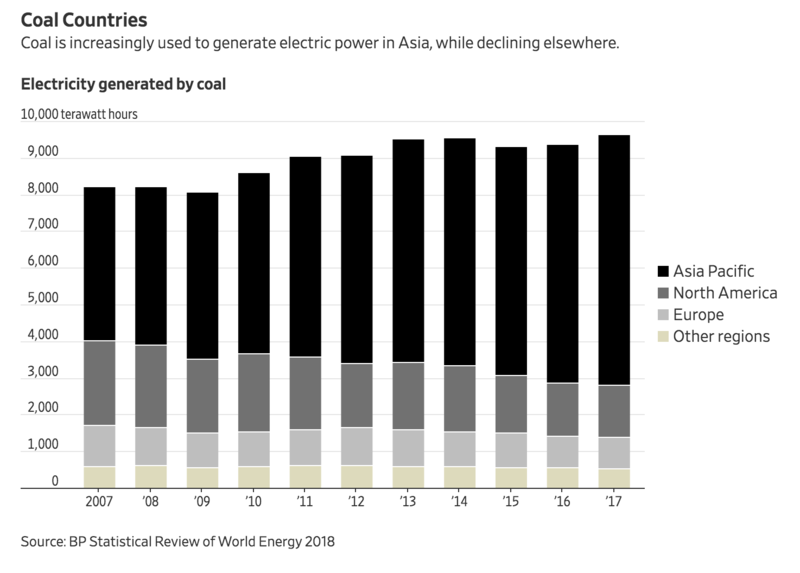 More recently, China has aided its development of coal plants. At this critical juncture of its energy development, Brazil cannot afford to abandon coal. Still, coal plants are attractive because they are less expensive to build than renewable energy facilities. The cost of constructing a renewables plant is roughly double the outlay of a fossil-fuel facility, experts say. 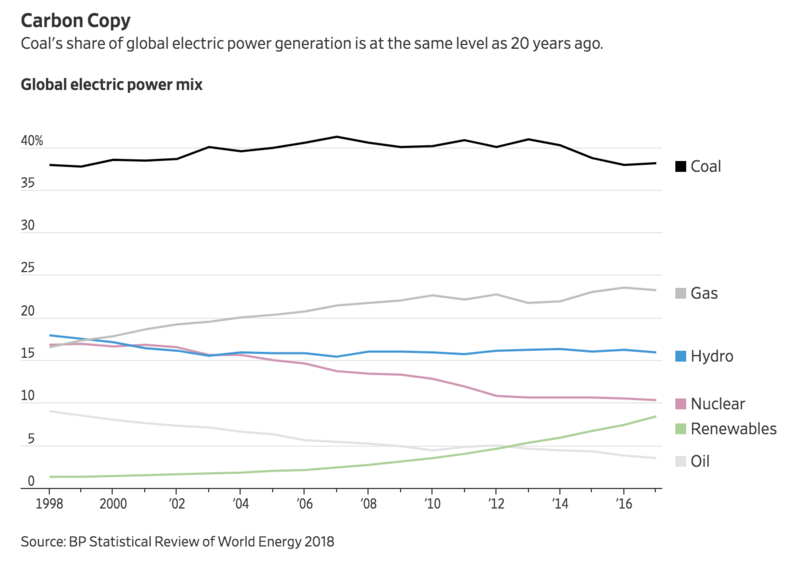 Government officials in developing nations, many of whom say they want to curb the use of coal to combat climate change, often face the difficult challenge of doing so without slowing economic growth. Bangladesh plans to use coal to generate 50% of the country’s power by 2030, up from 2% today. Like many countries in the region, it is funding its expansion with loans and technological help from China and Japan. In 2030, when countries have to take stock of their commitments under the Paris climate agreement, India will double its carbon dioxide emissions from its 2012 levels, but will still be within its intensity pledge, according to a new study by experts from the New Delhi-based Centre for Policy Research and elsewhere. Local UK council pension funds have more than £9bn invested in companies engaged in fracking, despite fierce debate over shale gas exploration. The data tracked exposures in March 2017, when local council pension funds had total assets of £290bn. Funds with the biggest exposures as a proportion of their overall portfolio included Greater Manchester Pension Fund, the UK’s second-largest local pension scheme with assets of £17.2bn, and the £834m Dumfries and Galloway Pension Fund. The funds had exposures of 5.8 per cent and 6.7 per cent respectively. Lancashire County Pension Fund has assets of £7.1bn, of which 2.6 per cent is exposed to fracking, although only via indirect exposures through passive investment products. WINNIPEG, Manitoba (Reuters) – With one surprise court ruling, Canadian Prime Minister Justin Trudeau faces the risk of contesting next year’s election with key pieces of his economic and environmental plans in ruins.